1. How did you come up with the idea for Zombies Don’t Eat Veggies! ? 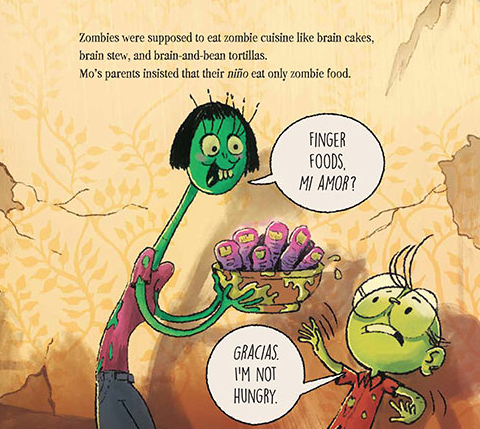 Megan & Jorge Lacera: We really wanted to do a zombie book. We love zombie movies and so admire the late director, George Romero. Plus, our kiddo has always loved “creepy” things like monsters and creatures—he would dress up as a vampire when he was barely walking! We had a hard time finding books that would let him play with these type of “scary” characters in an age-appropriate way. It was also challenging to find humorous books that featured multicultural, bilingual families like ours—so we set out to create one. Our intention was for the book to be read aloud and enjoyed by kids and adults together. As far as the story goes, Mo Romero’s character developed first. We imagined this zombie kid who didn’t know if he was really a zombie. He liked different things from other zombies. And he was much more conscious than typical zombies…so he still held onto his humanity. Everything flowed from there. 2. Did you love a certain type of food or dish that your parents hated? If so, what was it? JL: My parents didn’t exactly hate them, but they didn’t love hamburgers. My mom always took the bun off! This was before the whole Paleo-diet, low-carb craze. I loved burgers and thought she didn’t know what she was missing. ML: Not really. But one thing that happened while I was growing up is that my sister stopped eating red meat. She was very firm on this. I was always impressed that my parents just went with it and either made something different for her or gave enough warning so she could whip something up herself on nights when we had something that was off-limits for her. 3. This book shows that it’s OK to be different, but right now in our society, it feels like people are not accepting of people or cultures that are not familiar to them. What would you say to someone who thinks that diversity is not needed in the classroom or in children’s books? ML & JL: We think this has always been a challenge. We don’t pretend to have all of the answers—one hope with our book is to show kids and adults that it’s important to accept your own differences, regardless of what other people say or do. It’s not always easy—we all want to fit in, be accepted by our families, friends, communities, the world! But ultimately we don’t have control over what other people do…we often have to dig deep and determine what makes us happy, regardless of how other people feel about it. We believe it’s crucial for kids to be supported through the books they read and in their classrooms. There are all kinds of people in the world and we all think and live differently. When kids are allowed to explore those differences in themselves and in others, they’re able to form healthier relationships with their own minds and hearts and accept the uniqueness of their friends, families, and citizens of the world. 4. What upcoming projects do you have in the works? We are already working on picture book #2 with Lee and Low. We don’t want to give away too much, but it centers around a group of best friends who all live in the same apartment building and are faced with losing their home. Individually, Jorge is illustrating two other books; one by Deborah Underwood, and one by Nancy Viau. Megan is working on a middle grade novel set in West Virginia. Together, we’re also in the early stages of creating an illustrated middle grade series set in Cleveland—where we met! 5. If you had to choose your favorite dish from this story, what would it be and why? The Romero Family’s famous shockamole! We make it all the time at home and for friends. Our son, Kai, loves eating with a bunch of different veggies like cucumbers, bell peppers, and red peppers. He’ll also eat it with fish! Besides peanut butter, it’s one of our few staples that Kai will readily eat…which makes everyone a whole lot happier. Purchase a copy of the English version and the Spanish version on our website. Jorge Lacera was born in Colombia, and grew up in Miami, Florida, drawing in sketchbooks, on napkins, on walls, and anywhere his parents would let him. After graduating with honors from Ringling College of Art and Design, Jorge worked as a visual development and concept artist. As a big fan of pop culture, comics, and zombie movies, Jorge rarely saw Latino kids as the heroes or leads. He is committed to changing that, especially now that he has a son. Megan Lacera grew up in the suburbs of Cleveland, Ohio, with a book always in her hands. She became a writer and creator of characters and worlds for entertainment companies, and later formed her own creative company with husband Jorge Lacera. After reading many stories to their son, Megan realized that very few books reflected a family like theirs—multicultural, bilingual, funny, and imperfect. She decided to change that by writing her own stories. The family lives in Cypress, Texas. You can find the Laceras online at studiolacera.com.